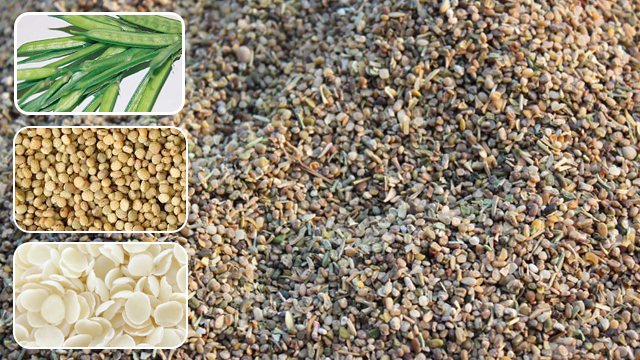 Guar meal is one of the important ingredients used as cattle feed. Guar gum and meal are both extracted from seeds of the same plant, yet the gum form of extract is used for its multiple properties for which it is applied as viscosifier, thickener, binder, gelling agent, stabilizer, emulsifier, flocculant and water holding ingredient. Whereas, meal form contains highest protein content for which it is preferred in animal feed preparations. In addition, this merchandize contains about 55% of protein (O+A) along with digesting content which makes it a reliable and safe ingredient for animals. The husk and germ obtained from the processing of splits are considered valuable components for cattle feed as the husk and germ has rich protein in them. The meal is a byproduct obtained after processing of seeds and these are obtained basically from the seeds of cyamopsis tetragonoloba, a plant that is from legumious family. The seeds are then toasted to high temperature to remove the trypsin inhibitor so that, the nutritive value improves. Processed form of this product can be applied either in combination with other animal feed ingredients or directly as an important material as it stays a very efficient nutritional food for animals. Guar meal korma is primarily used as an important raw material in the production of animal feeds, especially for cattle, fish, poultry, swine, etc. The processed form of this product is suitable to feed animals and it suits better than the one in unprocessed condition. It helps to fatten cattle in short time period. Before processing it carries a different odor not much pleasant. But in purified condition, it becomes without any foul smell and stays completely consumable. In earlier days soya meal had been in usage in the food preparation of animals, while considering the cost factor, guar meal korma remains one of the cost effective and fruitful alternatives for farmers in India and many of them have shifted their preference to this merchandize. This product suits best for routine feed for dairy cattle and the quantity of feed can gradually be increased day by day depending on how the animals accept. It is preferred because of its excellent nutritive value and good source of protein content, amino acid, etc. Adding up to 10% of korma with usual animal feed is the safe consumption level. It is one of the byproducts extracted from guar seeds. After processing it remains free from salmonella, E-coli and other infections. It contains minimum of 454% oil and albuminoid and can be used as a good binding agent for palletizing other animal feed raw materials. For poultry use it can be applied in the range 4-7%, swine feed it can be used between 5-7% and for feeding ruminants it stays safe if used between 5-12%. However, it naturally contains 38-42% protein. Churi is available either as husk or powder texture. It is considered to be one of the most nutritious ingredients for animals that are also rich in protein. It is produced without the influence of any chemicals thus it remains a completely safe to use merchandize in animal feed industry.